India's politics were on the boil on March 22-23, 2006 and promise to continue to be so in the weeks ahead as the media excerpts would show. 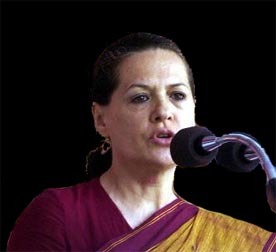 In addition the electronic media constantly highlighted as to how the Congress Government in these last few days had scripted a Parliamentary fraud to pre-empt a certain disqualification of Ms Sonia Gandhi as a Member of Parliament on the same grounds on which the Congress had spearheaded the disqualification of Mrs Jaya Bachhan a few days back. Little did the Congress Government realize that it would become a victim of its own conspiracy and in the process damage the image of its leader and the Party. Since the Congress Party could not introduce an Ordinance while the Parliament was in session to pre-empt Sonia Gandhi's disqualification from Parliament it took refuge in adjourning both Houses of Parliament without taking the Speakers into confidence. Having done that, it was then planning to bring the concerned Ordinance to protect its leader's position. On the verge of finishing its script, the Congress had to face the 'shock and awe' of India's Opposition parties, some of its own allies and a shrill campaign relentlessly pursued by the Indian media, both print and more effectively by the electronic media. Faced with such overwhelming opposition and damage to its image, at the time of writing this piece, Sonia Gandhi has announced her resignation as Member of Parliament and as Chairperson of the National Advisory Council. The Congress spin-masters have termed it as the 'Second Great Renunciation' by Sonia Gandhi. The Opposition has countered this by pointing out that if Sonia Gandhi was so concerned with setting high standards in public life then she should have resigned as soon as Jaya Bachhan was disqualified and not waited for an Ordinance that was on the way to save her, by the Congress Government. That it was pre-empted is another story. Readers can draw their own conclusions. Whatever be the conclusions, one fact that stands out is that the 'Indian Democracy' is alive and kicking and that India at large is alert and vigilant to foil 'fiddling with the Parliament'.